Volkswagen’s SUV range expansion continues with news of a new turbodiesel engine option in the T-Roc compact SUV. When T-Roc debuted in Volkswagen Retailers across the UK at the turn of the year, two petrol engines were available. With the arrival of the latest engine option, the range now comprises three petrol and two diesel engines. 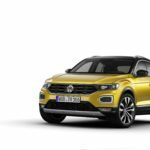 The two newest members of Volkswagen’s growing SUV line-up – the T-Roc compact SUV and practical Tiguan Allspace seven-seat SUV – are now available to order in R-Line trim. The new range-topping trim level – offered across a selection of engine and gearbox combinations in both model ranges – adds distinctive sports styling inside and out along with equipment upgrades and enhancements commensurate with the top spec’ positioning of the R-Line trim. Meet the T-ROC, the latest Volkswagen SUV concept, which is making its debut at the Geneva Motor Show.